WPW009499 WALES (1923). 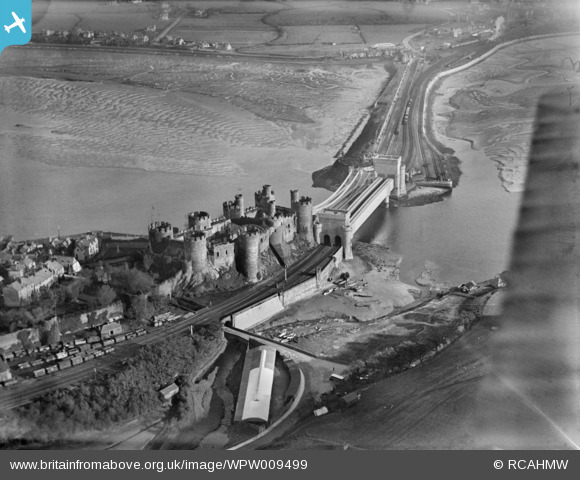 View of Conwy showing Castle and Bridges, oblique aerial view. 5"x4" black and white glass plate negative. 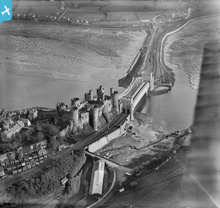 Title [WPW009499] View of Conwy showing Castle and Bridges, oblique aerial view. 5"x4" black and white glass plate negative. Everybody is familiar with Telford's suspension bridge and Stephenson's tubular bridge, but there was also this pedestrian suspension bridge nestling between them. No longer there, does any one know when it was built, and subsequently removed?